Frontline Plus is a “spot-on” application for the prevention and treatment of fleas in dogs and cats. By purchasing a 12 pack this October; your pet can be treated for fleas on a monthly basis to ensure they remain flea free year round. Frontline Plus kills adult fleas fast; PLUS prevents the development of flea eggs, larvae and pupae to prevent re-infestation. PLUS it controls Flea Allergy Dermatitis and biting lice in cats and dogs. PLUS, a monthly application of Frontline Plus also controls brown dog ticks; PLUS if applied fortnightly, it will also protect your dog from paralysis ticks! 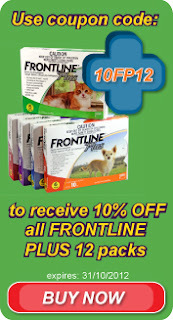 This offer is only available until October 31st, 2012 so purchase Frontline Plus today; to offer your pet additional protection this flea season!